I knew better than to expect a repeat of my last trip. Both the air and water temps have dropped quite a bit since last Tuesday. Today, the air temperature topped out around 50º and probably didn't stay there for very long. The water temperature was 51º when I checked it around 11:30 this morning. Going into today, I knew ultra aggressive salmon were not going to be in the cards. Last night, I thought about which fly might be the one to use. A #10 Almost has been my hot fly this season, but I figured I'd need something a little bigger, heavier, and more colorful to tempt a lethargic salmon. 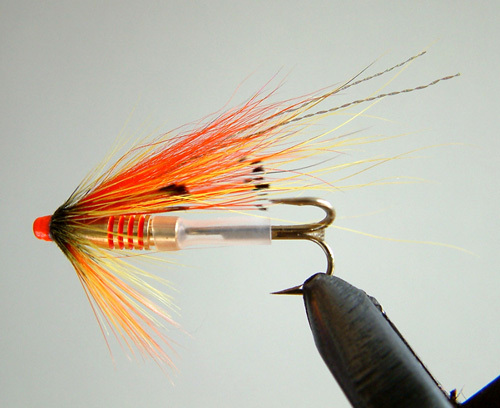 I remembered a tube fly I had tied for a trip Russia's Kola River back in 2012. The pattern is called the "Golden Shrimp." It was created by the late Yuri Shumakov, a very innovative Russian fly tyer. I definitely didn't fish the fly while in Russia. Before today, I'm not sure I had ever fished anywhere. Sometimes a particular fly speaks to us. For some reason, this one spoke to me. I chose to listen and I'm glad I did. I almost always make my first run through a pool a conservative one. I fish a relatively small, unweighted fly, hoping to bring a salmon to the surface. I can't remember what I tried first. Maybe it was an Almost, but I'm not sure. Anyhow, it didn't work. I went right to the Golden Shrimp on my next pass. About 10 minutes later, I was tight to a salmon. If I had my druthers, I'd have caught it with a two handed rod, swinging a size 6 or 8 wet fly just under the surface. Instead, I had to settle for putting a small, heavy brass tube fly right in the salmon's face with my 9' 7wt. Sage. I'll take it. I explored some other water today, but didn't find much going on. I was even reprimanded for parking on a private road! I've never had an issue there in the past. I've had locals ask me how the fishing was and make small talk. I guess I just ran into the wrong dude today. Oh well...be careful where you park. Eventually, I made my way back to the original pool. I fished a sz. 8 Sugerman Shrimp through the run. Normally, I would swing the fly. The flow is still so weak (80 cfs) that I had to strip it. When the salmon are lethargic, don't expect bone crunching takes. Under these conditions, they often nip at the back end of a fly. A salmon grabbed my Sugerman Shrimp, but I pulled the fly out of his mouth while stripping. The fish felt the steel and it was game over. I wanted to get home early, so I decided to try the "Hail Mary pass" when I went back to the top of the run. I stripped an HKA Sunray as fast as I could and got another short strike (from a different fish). I rested the fish and tried again. The salmon came back for the fly, despite feeling the hook. I was surprised. I got the fish up once more on a hitched Sunray Shadow. Unfortunately, that was as far as I got before I had to head home. Under the circumstances, I'm pleased with how today went. 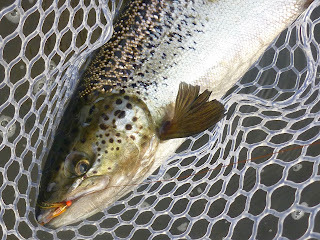 If nothing else, it made me realize I need a better plan for low water salmon who prefer to nip at the back end of a fly rather than grabbing it with gusto. I have plenty of flies for those fish when the water is up (this behavior is common in the winter and early spring), but not as many options for cold conditions in unusually low water. The gears are spinning and I will be well armed next time.